Current list of Artisan Jewelry designers websites, blogs, social and selling sites. One-of-a-kind eclectic style jewelry featuring leather, metal, natural stones and more. I love combining natural stones with leather and metal. I am particularly fond of copper and antique brass – but nothing beats sterling silver with turquoise too. Texturing metal and leather have become a favorite of mine and I like to combine these elements in my jewelry. I hope as you are browsing my website and store that you find something that you like. Must-Haves Jewelry is the place to find designs with a difference. Specializing in unique one of a kind designs. I handcraft each piece of jewelry, using gem stones, silver, artisan lampwork and unique finds from around the world. Mosaic Planet Jewelry is the creation of artist Jewel Lerato. Her micro mosaic jewelry is inspired by the diversity of design that comes from other cultures. The symmetry and colors of Arabic tiles, the ornate and rich detail and jewel tones present in Indian saris are just some of the things that inspire her. She uses only real Swarovski crystals and Japanese seed beads and sterling silver embellishments within each piece. Each of these components is hand selected, and hand placed with tweezers into 99.9% fine silver plated frames. All earring wires and chain are silver filled. Please enjoy these mini pieces of art! Colorful, whimsical, elegant wearable artisan jewelry by Meredith Jordan. Necklaces, bracelets and earrings made with artisan glass and fiber beads, sterling silver and gold-filled components, Austrian crystals and other sparkly, twinkly stuff. Handcrafted micro macrame jewelry and accessories made with colorful cord and beads - unique pieces that you won't find mass produced. My pieces are one of a kind and can be very eclectic. Each tells a unique story. I love working with metal, gemstones, beads, ceramics, pearls, mixed media, resin, photography, and found objects. You'll find unique, original handcrafted jewelry. Designs that make a statement for every kind of life styles in a unique way. Each piece is created with love and passion and with it you acquire a small fragment of my heart and soul for beading and with it you'll have a piece of jewelry that you can wear everyday. In 2001 I stared to Bead and have been participated in craft shows,expos @ the del mar fair & Expo de Moda, gem & mineral exhibitions and contest, have publish work in Bead Trends Magazine, Jewely Stringing Magazine, Bead-It Today Magazine, displayed my designs in the BMCC (Bonita Museum and Cultural Center) gallery and work with wonderful persons in the beading industry. Stylish. Feminine. Classic. My unique, handcrafted, one of a kind bracelets, necklaces, and earrings make great gifts! Stained glass, Stained Glass Mosaics, Art Glass, Fused Glass, Beaded Bookmarks, Wire Jewelry and more. All items for your home and garden. I also make wire-wrapped, beaded, metal, macramé jewelry. One-of-a-kind handmade artisan jewelry. I am a published jewelry designer and lovingly craft each piece. Colorful, lovely handmade jewelry, nostalgia of Italy and scandinavian hints...I love stones and their properties, the charme of vintage and some sparkling :) And I only use animal friendly/vegan material. Hand-crafted Artisan Creations Made in Stamford, UK. If it's signature jewellery you're after... look no further! At Jewellery by Shalini we hand-craft every single piece individually. Greatest attention is given to creating the most exquisite of designs, to selecting the best suited materials, to polishing and shaping with utmost care. Original jewelry designs with unique textures in leather and metal by Melinda Orr. .To realize that we are all imperfectly perfect, that is what makes each of us very special. Visit my store! Julie Thelen is the designer of unique, one-of-a-kind, high-quality pieces of jewelry that typically feature other artists' components. 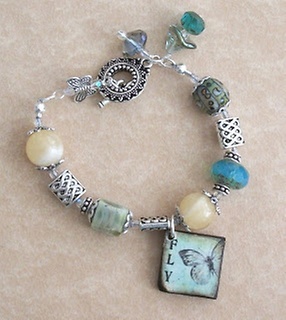 Current focus is on clay, lampwork and gemstones -- as well as anything rustic, unusual and beautiful. Custom orders welcome. One of a kind wearable art, with beaded metal and leather being my 'current' passion. Wind Dancer Studios creates jewelry with a romantic, vintage and bohemian feel. Visit my store and facebook page! My jewelry are handmade and are one of a kind. I do take special orders. Please join in and add your or your favorites to our lists! You can also embed, share & blog about our lists on your sites. Get inspired and build your beading business.